A big thank you to everyone who came out to our public event last night at Sport and Medical Sciences Academy! Listening to the community is how we will make smart, informed, and creative decisions together to build a successful project. Read our summary of the event below. Please note some light editing on the questions and answers. If you couldn't attend, you can always email us with any questions or ideas or leave a comment on this post. TJ Clynch presented an overview of Civic Mind’s proposal to redevelop Dillon Stadium –— full presentation available here. He stressed the importance of thinking about the project as a quality of life initiative, not a driver of economic development. Civic Mind’s proposal is community-centered, imagining Dillon Stadium as a public park and an anchor of the surrounding Coltsville neighborhood. The project is fiscally conservative and socially responsible, growing in phases as new user groups see value in activating the facility. The first and most critical phase is to make the field playable and safe for local and regional groups –— Hartford Public School athletics and regional tournaments hosted by the CIAC. Civic Mind has raised a private investment of $1.5 million to make critical upgrades to the field, equipment and fan accessibility. Dillon Stadium should be a venue the City of Hartford —– especially its students and families –— can be proud of. Civic Mind envisions itself as the facilitator of community action, managing a public process to shape each phase of the Stadium’s growth and working with Stantec, the technical design partner, and key foundational organizations –— the City of Hartford, CIAC, Friends of Colt Park, CRDA, Hartford Public Schools –— to get the community involved in the project. The idea is to build community wealth, not individual profit: “we” first not “me” first. Revenue raised at Dillon Stadium should remain in a “closed loop”: the money the stadium makes should be re-invested in Colt Park and the Coltsville neighborhood. Use Dillon Stadium as an anchor for development of the Coltsville neighborhood by exploring retail opportunities, restaurants, transit design, etc. Civic Mind makes this clear: no tax dollars should be used to enrich a private enterprise. If pro teams want to use Dillon Stadium, they should be responsible for providing the necessary design and development. The vision for 2018? A rehabilitated, refreshed stadium that is a safe place to play and instills a sense of civic pride. Civic Mind will work with the City to identify a management structure and engage the community in a master planning process to identify needs for the next phase of growth. See our development phases for more information. Paul Holzer, a local education activist and the executive director of Achieve Hartford!, was impressed by the show of public participation in the room. He reminded the group that, as citizens, we have the responsibility to get involved and fix city problems ourselves instead of waiting for leadership from others. He supports a different kind of thinking where collective action and the hard work of a few dedicated individuals can make real, lasting change. 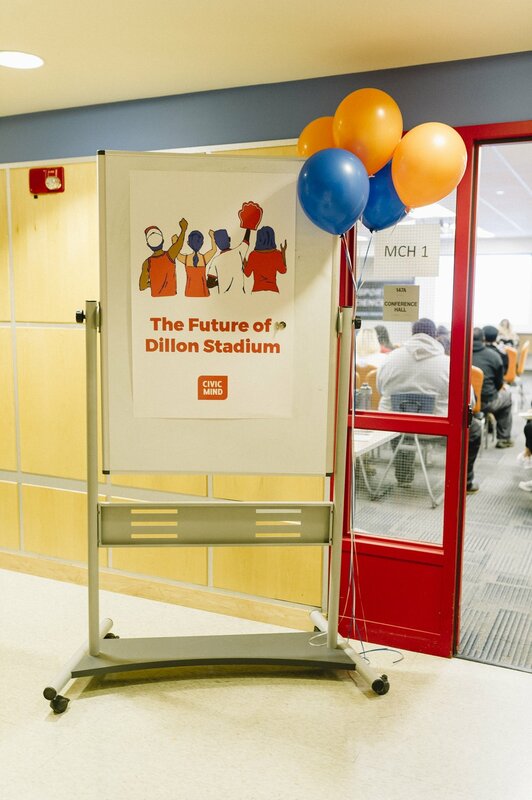 Dr. Karissa Niehoff, the executive director of the Connecticut Interscholastic Athletic Conference (CIAC) and the Connecticut Association of Schools (CAS) has endorsed the project, seeing the benefit of a refurbished and reimagined Dillon Stadium for statewide athletic games. She applauded the SMSA football team—one of the top 16 teams in the state to compete in upcoming championship games –— despite the lack of a full-sized football field for practice. For her, the importance here is equity: making sure all students have access to high-quality facilities, equipment and resources. Hartford lags behind other communities with impressive fields and well-funded athletics programs. Her comments were echoed by parents in the room, who drive their students to surrounding towns to use their public facilities since none exist in Hartford. Dr. Niehoff committed to bringing state tournament and alumni games back to Dillon (the CIAC stopped using the stadium 15 years ago when it fell into serious disrepair) and exploring the opportunity of hosting clinics and camps at the facility. Mark Greenberg, Civic Mind’s private investor, is involved because he believes this is the best proposal he’s seen to renovate Dillon Stadium: it's the best for the community and the most fiscally responsible for the City. He remembers the golden days of Hartford as a destination for Connecticut residents and a city well-regarded across New England; he wants to get involved with projects, like Dillon Stadium, that reposition the city as a leader. Question: Will this be a nonprofit stadium? Will you need a 501(c)3 or can you work with another nonprofit institution like SMSA? Civic Mind: Civic Mind is the only group that wants to manage the facility. Our vision is a social enterprise, where decisions are made for social benefit, not just profit. We will have to work with the City to discuss operational agreements / contracts, and build the appropriate management structure. Q: As the stadium grows, won’t there be more operating costs? Will it cost more for schools to use the stadium as it becomes more expensive? CM: The more people that use and activate the stadium, the more attractive it will become for marketing, advertising and retail revenue. As it stands, we don't agree with the funding arrangement where schools have to pay the City for using Dillon stadium, essentially moving money around departments. We envision different sources of revenue to support stadium operations, including additional events, sports camps, concerts, etc. Q: Many athletic programs in Hartford suffer from lack of facilities, including track and field. Can you envision an 8-lane track at Dillon? And what about the off season? What types of other events (i.e. car shows) can be held there? CM: We want to work with the community to define their needs and design solutions at Dillon Stadium. If a track is something the community needs, we will find a way to make it happen in a phase of redevelopment. Our goal is to keep the facility open to the public and constantly active –— other events would definitely be welcome. Q: As a parent, it is disheartening to watch our kids play in bad, broken down facilities when surrounding towns have much better places to play. Why should our kids be subjected to these bad, unusable facilities? CM: We agree that the current state of Dillon Stadium is an embarrassment. We want to work with the community to design something our kids can be proud of –— and other teams from across the state will want to play here, too. Our approach is grassroots, but grassroots work is hard. It asks a lot from those who don’t always have the time or energy to get involved –— parents and teachers and community leaders who are stretched to the max. But your voices need to be heard and we all need to come together to make sure our concerns are taken seriously. Q: What is the timeline for a decision? CM: CRDA has not announced a specific timeline. They are making a recommendation to the City of Hartford on November 30th, and ultimately the City will make a final decision. Q: What about parking? If this is going to become a regional attraction, what is the solution to parking? CM: What we don’t want is to turn city-owned lots to private operators who will charge parking fees for high school and tournament games. Parking agreements will have to be negotiated with lots in the area, including at Colt gateway. Tony Cherolis from Transport Hartford discussed a transit-oriented design approach to the development at Dillion, building infrastructure for busses, cycling and pedestrians to connect the stadium with other areas of the city. Downtown Hartford is within walking distance, and 2-4 miles away you can reach the North End and Windsor, Wethersfield, East Hartford. There's already a lot of parking lots in the neighborhood, but not enough "stuff." A holistic and sustainable approach to transit –— not just more parking spots –— is key to success in Coltsville. Q: if this is a public park, how do you keep it from being destroyed? Will this be a public-private partnership? I don’t see the City or State with enough money or capacity to manage this facility and stay on top of its upkeep. CM: We need to work with the city to develop a management structure. For example—is DPW in charge of maintaining the park, or a private company? Private security will protect some of the stadium assets as it grows in development. Have a question? Email us. We'll give you an honest answer.